DeepMatching is a matching algorithm developped by Jerome Revaud in 2013. Its purpose is to compute dense correspondences between two images. DeepMatching relies on a deep, multi-layer, convolutional architecture designed for matching images. 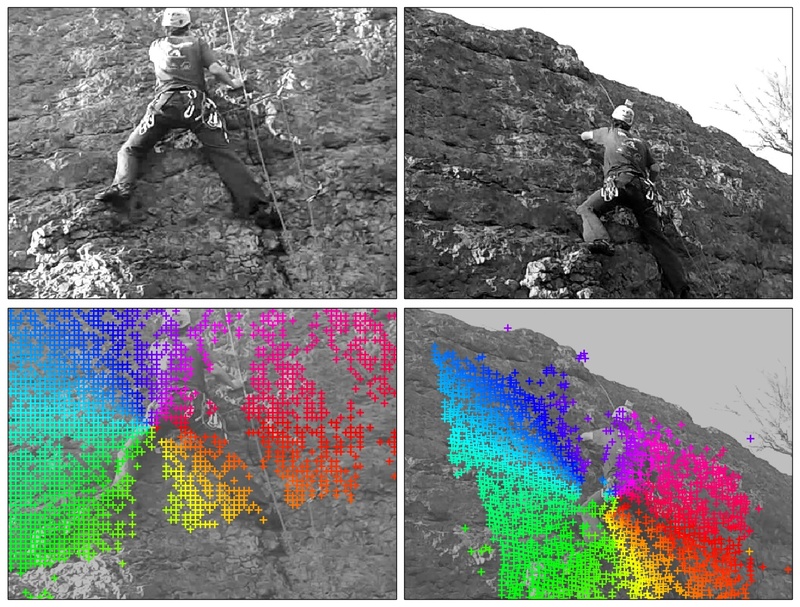 It can handle non-rigid deformations and repetitive textures, and can therefore efficiently determine dense correspondences in the presence of significant changes between images. We have evaluated the performance of DeepMatching, in comparison with state-of-the-art matching algorithms, on several datasets (see technical report below for details). DeepMatching outperforms the state-of-the-art algorithms in terms of accuracy and shows excellent results in particular for repetitive textures. DeepMatching was recently used to improve the estimation of optical flow in several methods like DeepFlow and EpicFlow (joint work with Philippe Weinzaepfel, Zaid Harchaoui, Cordelia Schmid). Results on MPI-Sintel are currently state-of-the-art. Please note that our code is mentioned only for scientific or personal use. - Added new mode for full scale and rotation invariance. - Added a new option "-ngh_rad" to restrict the matching to a local neighborhood, which enables much reduced memory usage and computations. - Statically-compiled version is now fully multi-threaded with BLAS (but still much slower than if you compile it yourself). - Few minor bugfix, code cleaning and updates. - Now performing the maxpooling and subsampling steps jointly, which results in using 50% less memory than before. Also, it is a bit faster. - Removed some useless/confusing options in the executable. - Now include a Matlab and a Python wrapper! - Windows version (Visual C++) now available (Credit to Mitchel Benovoy for porting it). - requires Python2.7, possibly SWIG (not mandatory), and caffe's dependencies (caffe is provided). After downloading the code, unzip it in some folder and compile it with make. The compilation has been tested on Linux (Fedora 21) and Mac OS X (CPU version only). For Linux, we have included a pre-compiled executable (CPU version only). For it to work, you must have installed python 2.7, PIL (Python Image Library), numpy and matplotlib.